Updating your bath to include Houston frameless shower doors can enhance your enjoyment of your home and increase its value at the time of resale. These elegant bathroom fixtures are rapidly ascending the list of must-have amenities among home buyers and are an excellent way to update your bath quickly and effectively. Here are some of the most important comparisons between frameless shower doors and traditional shower curtain arrangements. 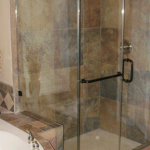 Frameless shower doors in Houston are designed to last for years while retaining their elegance and functionality. By contrast, shower curtains typically require replacement within six months to a year. This can add up to a considerable additional cost for you and your family over the one-time expense of installing frameless shower doors for your bathroom. Frameless shower doors are available in a wide range of designs and patterns from clear to textured, making them an ideal addition to your bathroom décor. These fixtures typically are designed to allow light to shine through them easily, enhancing visibility and ensuring the most relaxing experience in your shower. While shower curtains are available in a wide array of designs, they also block off much of the ambient light and can create a closed-off, less expansive atmosphere in your bath. The one area in which shower curtains have a big advantage over frameless shower doors is in their initial cost. Shower curtains are usually much less expensive than comparable frameless or framed shower doors in Houston, making them a solid choice for renters and those with extremely limited budgets for upgrades to their living spaces. Frameless shower doors are remarkably easy to clean and can be disinfected as often as desired to ensure the most hygienic environment in your bath. Shower curtains, on the other hand, are generally more difficult to clean. Depending on the type of plastic used to fabricate these items, they may not respond well to disinfecting chemicals. It is usually wise to test a small spot on your shower curtain before using bathroom cleaning solutions to clean these surfaces. If you are considering an upgrade to frameless shower doors, the experts at Apple Glass can provide you with the most advanced options in Houston and The Woodlands. 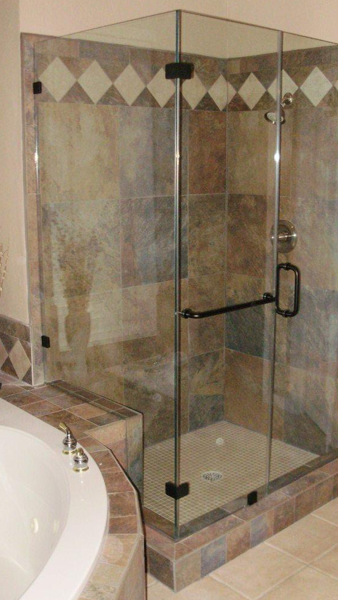 We specialize in frameless glass shower doors designed to your precise specifications. Give our glass technicians a call today at 281-296-0600 in The Woodlands or at 713-680-1400 in Houston to discuss your bath remodeling project with us and to schedule a free quote for your upcoming project. We look forward to the opportunity to serve you and your family. This entry was posted in Showers and tagged Frameless Shower Doors in Houston, Houston Frameless Shower Doors, Shower Doors in Houston. Bookmark the permalink.